Broken Wing (2004) is a bronze work that represents objects, often taken for granted, that are depended upon as part of our daily routine - like a wing nut for a carpenter. 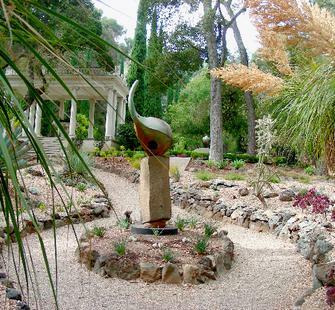 This piece is installed in the Phelan Cactus Garden, located on the north end of the Italianate Garden. In 2010, Broken Wing became the first sculpture permanently acquired by Montalvo as part of our Sculpture on the Grounds exhibitions.